Upon delivery into our foyer, my husband removed the nightstand from the box it was shipped in. He commented that he was impressed at how well the furniture had been packed for shipping. Once all the packing material was removed, we both were very pleased with the quality and appearance of the nightstand. We are extremely happy with our purchase. This Verona nightstand from Furniture of America features a classic design with a modern twist: a hidden drawer where you can keep valuable items out of sight and out of reach. 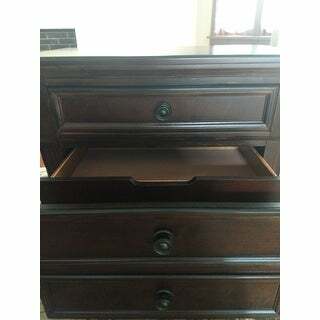 This nightstand has a large lower drawer, a secret drawer inside the large drawer, and a smaller upper drawer lined in felt. 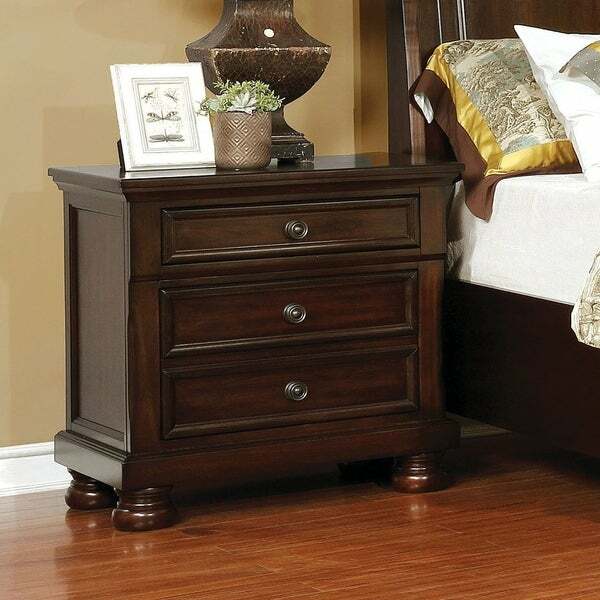 This nightstand is available in your choice of brown cherry, white, or black finishes. Dimensions 28.0 In. X 17.0 In. X 28.0 In. I love it. Solid wood. Big bun feet. Very solid and heavy. Has a hidden drawer inside of the large bottom drawer. Top drawer and I think the pull out drawer I felt lines. This is the best nightstand I ever bought. The first one had slight issues and the second one had very slight paint drippings only on the bottom drawer and they are sending me the replacement drawer. This product is so good I would do it all over again. Highly recommend it! Awesome, sturdy, solid night stand! The color is beautiful (dark cherry). The hidden drawer is fantastic and felt lined! The only assembly is to screw on the feet, so simple!!! Definitely the nicest night stand I have ever owned! Very happy customer! The deep drawer. Yes I recommend this nightstand. Bought two for my master bedroom and I LOVE THEM. Arrived fully assembled except the feet, and incredibly well packed. They were in perfect condition. Roomy; very high class looking - better than furniture costing twice as much at a local furniture store. These have to be one of the best buys on Overstock! Beautiful piece of furniture! Very satisfied! This piece of furniture is exceptional in construction and materials. It is a little weighty when trying to carry it up the stairs but it is worth the effort when it reaches its destination! "Is this available in cherry? I don’t see that option. I only see black or white. Thank you"
The cherry finish is no longer available. "How deep, vertically, is the top drawer?" "How tall is the night stand?" Dimensions are: 28 inches high x 28 inches wide x 17 inches deep.